Talked to Mark at Reno HiFi today and he has a demo X150.5 that is just coming back to his place. We have come to an agreement on price and it will be shipped out next Monday or Tuesday. Merry Christmas to me. But this is getting crazy! Congrats and Welcome to the club, you won't be disappointed. Now we need to start a Pass labs forum. Jack, what will you be using for a preamp? For the time being, I'll use my Anthem 225. A friend of mine has a Parasound P3 preamp that he isn't using, do you think that would be a decent pre to start with. I'd like to try out a Pass Labs X1 or an Audio Research LS17 when the funds become available. Mark and I were discussing cables and I told him that on the amp end of my speakers wires I have locking bananas and he said that Pass Labs puts stoppers in those holes as bananas are no longer UL approved as a connection. He said they easily pop out so you can use them. What do you use at the amp end of your speaker wires? Last edited by Jack in Wilmington; 11-14-2013 at 03:55 AM. Congrats Jack. This is all intriguing so I really need to shlep down to Wilmington soon to hear what the craze is all about. The welcome mat is always out. It has been crazy around here lately. First I got a new SACD player, then a Shunyata Research HDMI cable to connect it. Then a set of Acoustic Zen XLR cables to connect my DAC to my integrated amp and now the X150.5. Since you as, Jack, I'm using Blue Jeans Cable's balanced cable utilizing Belden 1800F wire and Neutrix XLR connectors to connect my Audio Research LS9 to my X150.5. Check those cables out HERE. The seem to work very well indeed but I haven't tired other makes. Cool, same here so we have to make a plan, maybe around or just after the holidays. My wife and I are looking forward to checking all the toys out. For a while I thought I might be coming up your way as there is a Pass Labs distributor in Southampton if my memory serves me right. Other than a weekend volleyball tournament, in Hershey, the first weekend, we are free in Dec. Bathroom renovation starts the Monday after Thanksgiving, but that doesn't affect me, just our contractor. Thanks, I'll check them out. 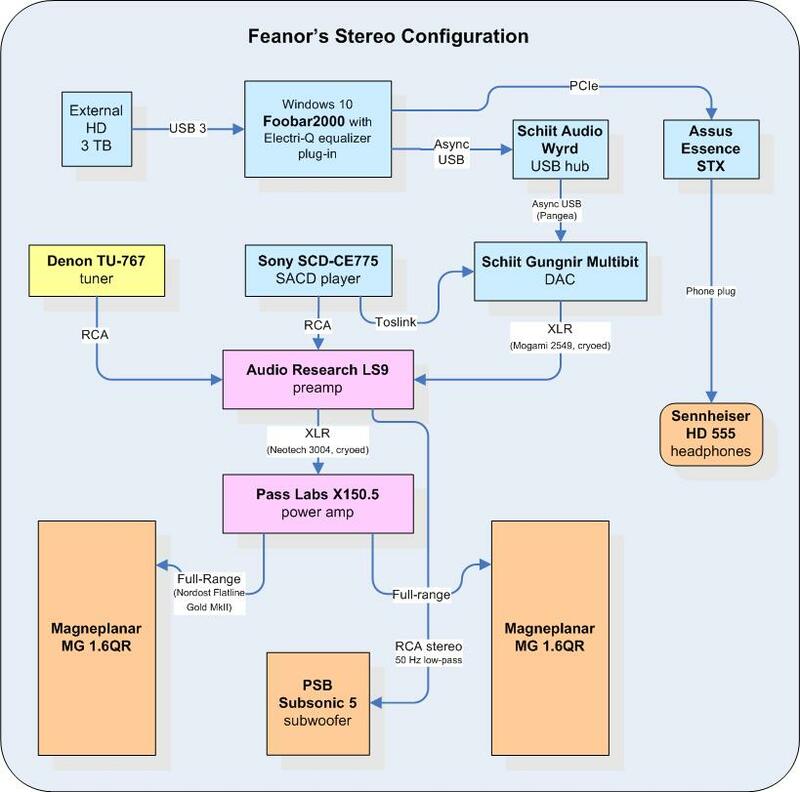 Is there a ARC preamp between the LS9 and the LS17? Looks like you are talking about Ultra Systems, but google can't seem to locate them or a good website. EDIT: I just realized they are the same as The Cable Company and they are in New Hope. I was there when they first opened in the 90s. Last edited by Hyfi; 11-14-2013 at 05:52 AM. Jack I use bare wire as the X250 has no provisions for banana's, only bare wire and spades. Currently I am using BJC 10g Belden wire with Banana's at the speaker end and bare wire on the amp side. I was using Monster Z4 with the Parasound but it has double ended banana's. I need to get the spade adaptors as I like the Z4 cable. They sound good and they are as thick as a garden hose. The P3 preamp is ok, it has had mixed reviews. See how it sounds compared to the anthem. Today I missed out on a pristine used X1 preamp with the full double chassis. I was vasilating back and forth if I should buy it the last 2 days and it sold. I was going to pull the trigger today. Last edited by blackraven; 11-14-2013 at 08:31 AM. There a few ARC linestatges that can be considered between the LS9 and LS17, plus some phono equipped models as well. But for linestagess, the LS10 and 12 are solid state and the LS15 and 16 are tube or tube hybrid. All have balanced output. A great place to explore vintage and newer ARC models is the Audio Research Database, ARCDB.ws. I saw that X1 and was wondering if you might jump on it. There is another one, but it probably isn't the double chassis. That was the X1 I was looking at. I may buy the other one. There is also a JC2 preamp for $2700 that I may inquire about. I think that the JC2 is a better preamp from every thing that I have read. I will call Reno HiFi and see what they say about it since they also deal with Parasound gear. When looking at the ARC be sure the description mentions balanced circuits, most ARC preamps offer XLR connections but not all are balanced. Feanor's is balanced. Do the 150.5 have the knobs on the back for the speaker terminals same as X250? Levinson has the same type. The Pass gear is really good, especially in transparency, resolution and detail, BJC cables are great even beyond their cost but to get full benefit from the Pass you need better cables, including a nice power cable. If you can't swing Clarus, then I recommend the Triode, I heard one and it's similar to the Clarus Crimson in character but not as good, but we were comparing a smaller gauge Triode so not exactly fair. I just placed a bid on the other Pass preamp. He has a bid on it but I bumped it up. If I lose out I may bid on the Parasound JC2 but it is a little more than I want to spend at $2700. I will see if he will take $2500. If not, there will be other X1's available at some point and maybe even a better BAT. It looks like he accepted the bid. Any one want to buy a Van Alstine Ultra Plus Hybrid tube preamp just a few years old and recently checked over by Frank Van Alstine himself. With the remote, current upgrades and home theater by pass switch it cost $2100. I will let it go for $1100 pending my approval of the X1. Last edited by blackraven; 11-14-2013 at 07:38 PM. The X150.5 has standard 5-way posts. I'm using banana plugs on Nordost Flat Line Gold cables that I've had for a few years. For a power cable I'm using an old, lower-end PS Audio shielded cable, 12 gauge I think. The X150.5 has remarkable transparency and ability to create almost tangible, (palpable), images of individual instruments & voices. The other remarkable characteristic is its dynamics, ("PRaT"); all percussion instruments including piano sound shockingly present and real (at least compared to other amps I've owned). Bass is very controlled and precise but not overly lean. Highs seem extended, not rolled off or overly smooth. As for the mid-range, some people like "liquid" but that isn't the right word for the Pass' midrange: it is focused -- sharp with good contrast to use a camera lens analogy. Neither the highs nor the mid-range are exactly warm, but they are free of nasties. It will be interesting to hear your impressions, Larry, but those Silnote are well beyond my budget. I'd looking for $200 I/Cs that might make a significant difference. E.g. I was asking the maker about Soundsilver Purity-XLR which would set me back $150 including shipping for a 1.5 meter pair, HERE. They are solid silver with teflon insulation. Last edited by Feanor; 11-15-2013 at 05:57 AM. Jack...congrats on your new Pass Labs amp! Raven...man no tubes in the chain???? Man you gotta have some tubes in there some Place!?!?!? I would go crazy without tubes! Just bought some NOS Valvo ECC91's for the AMP. I've been using some KOBE TEN tubes in both amp and preamp...along with Telefunkens in the pre. Blackraven, I too, will be anxious to see your impressions of the X1. Feanor I forgot you were using the PSA and Nordust. Will the silver XLR have a return policy? From what I understand the purity and gauge of the silver can make a big difference. Frenchmon, I still have tubes in my DAC. I really wanted a nice BAT, tubed CJ or Atma Sphere MP3 preamp but the models that I want are a little over my budget. From every thing that I have read the X1 is very tube like. If I don't like it I will be able to sell it for what I paid for it. There is a guy on the Audiocircles forum that has an X1 with Van Alstine gear that I have been talking with and that are his impressions. Last night I called the seller of my X1 and talked with him about 30 minutes. He feels the same way about the X1. He bought an ARC LS26 (which was on my short list too) and he states the 2 preamps sound very similar. Last edited by blackraven; 11-15-2013 at 10:47 AM. Wow Raven like Mr P you are going all in with a preamp as well. I have a little more time left in school and that is why I have to pick and choose when I upgrade gear and I can only do one major upgrade or so a year so it does not bust my budget and also I have to answer to the boss(Wife) since we are on on income with me using my rental house and school money saved to supplement so one major or a few minor upgrades a year is all I can do right now. But speakers and preamp are on my lists as soon as the funds are available but really right now I am rather happy with the Nuforce as it to does have a lot of tube qualities to it without the drawbacks of tubes in the low end and highs. I you read the reviews of the P8 they all say that it has a very "tube like" midrange. I have really looked at the X1 though as I have seen several for sale in the last 6 months. Most likely by the time i decide to upgrade(and have the funds to do so) the X10 will probably be the one to look at since it will probably be in my price class used.